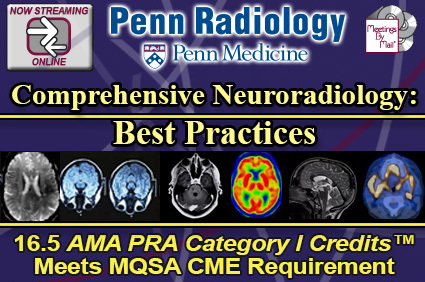 Penn Radiology’s thorough review of the best practices in neuroradiology features more than 20 experts providing an extremely detailed analysis for all interested in this imaging subspecialty. Radiologists, neurologists and neurosurgeons can use this resource in preparation for Board certification and recertification exams. Additionally, this activity is worth up to 25.25 AMA PRA Category 1 Credits™, all of which are applicable as SA-CME credits to meet the Maintenance of Certification requirement. Topics include: Spinal and cervicocerebral vascular disease and intervention, neoplastic and non-neoplastic disorders of the brain, spine, head and neck, functional MRI, perfusion and permeability imaging, molecular imaging, PET and spectroscopy. Additionally, a special pediatric neuroradiology session covers congenital and acquired disorders, fetal MRI, pediatric head and neck, ultrasound, and radiation dose reduction. HD video capture includes speaker’s cursor movements. Available in DVD-ROM and online streaming formats! Plus 20 additional expert presenters from Penn Radiology, Children's Hospital of Pennsylvania and others.